Still Producing at 22 years old! We say that Abby has the most beautiful head and face we’ve ever seen on a horse. Her face is just slightly dish-shaped, and her head is perfectly proportioned. Her tail touches the ground, and her mane is 24” long at its longest point. She is in amazing condition for a 22-year-old mare. She just gave birth, in May. See photos of her 2005 colt, Mr. Black, by Roll the Cash, a black son of Dash for Cash. He is Abby’s third foal since she came to us in 1999. 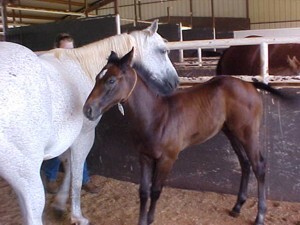 Her other two foals, Easy (2002) and Dash (2003), both inherited their mother’s gray color, beautiful head, and very good feet. Abby has served us primarily as a broodmare, but can be ridden, and we’re told she ran barrels for her former owner. We hope some of her foals will have an opportunity to try that, as well. If Abby goes to a new home, we will sorely miss her friendly, low-pitched, chuckling whinny of greeting. When she’s hungry, she watches the windows of the house for us to appear!